Because of an office move, contact numbers not being updated and an email glitch, it took almost two weeks for Saoirse and HSE Elder Abuse representative Geoffrey Blair to connect on December 16. Saoirse had been sorely disappointed at the silence of the Gardai, Dolores' doctor and priest. A sinking feeling was developing that her brothers and sisters were not going to act to help their mother, either. Her conversation with Geoffrey Blair immensely encouraged her and gave her great comfort. Surely Dolores' suffering at the hands of Ethan would soon be over. Geoffrey Blair received information from Saoirse regarding her visit with Dolores on December 3, evidence of Ethan's forgeries, and accounts of abuse that she had learned from her siblings. Geoffrey Blair immediately began to investigate and learn about Dolores' situation. I heard from the Public Health Nurse that the Home Care Attendant was with your mother on Tuesday. I called out today as I wanted to meet her before the holidays. She opened the door but didn't let me in. She said she was well looked after and had no complaints. She was polite but quite clear about this. Notice the phrase “...well looked after.” In other sections of this website, we will see and hear these words repeated by Dolores in what can only be described as a rehearsed and mechanical way. We note also Geoffrey's assumption that the rest of the family would be engaged in remedying Dolores' situation. It seems hopelessly naive with the benefit of hindsight, but we find no fault in this expectation. What family wouldn't rally to the aid of their mother? That's what families do. From December 22 through January 6, Geoffrey Blair was out of the country for the holidays. Many thanks. I really appreciate your efforts. She is quite protective. I will update once we've arranged the Dublin visit with her. You should be hearing from me after the holidays. I'll at least know whether she ended up meeting Alex and the rest of us or if we were stood up. Again, many thanks. I'm just trying to figure out how I can maintain this, knowing she's so protective of Ethan and allowing this to continue. I'm just hoping she hears enough from the rest of us. In the meantime, I would like to try and set up a visit with yourself, possibly the nurse and maybe even just me with my mom to just remind her there are other siblings here and in this case that just want to spend time with her. And no other motives. Take a breather and enjoy your holiday season. I'll be in touch. This initial enquiry into Dolores' welfare produced a bit of a flurry. 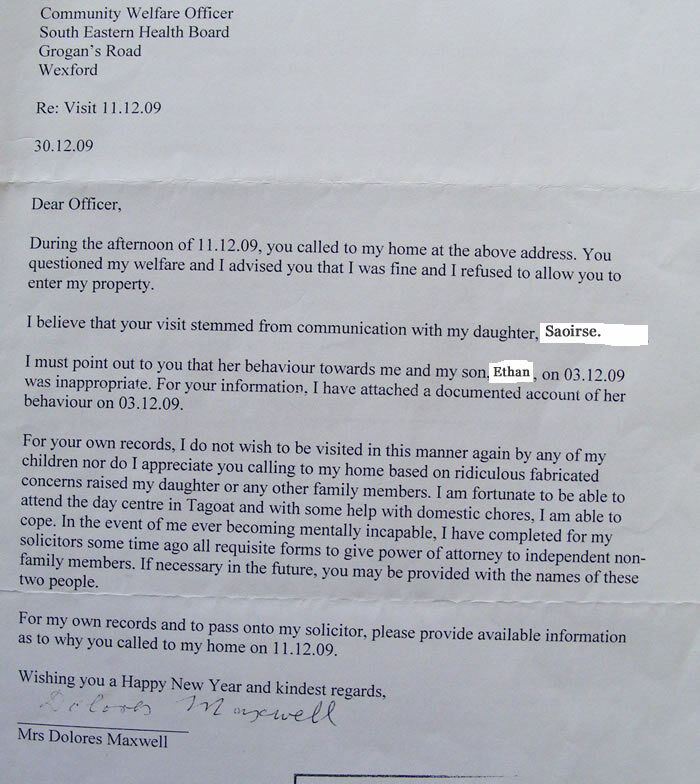 A letter from “Dolores” was crafted and sent not to the HSE Elder Abuse, but to Wexford community services. The astute reader may begin to recognise the voice by now. So much of Ethan is oozing out of this letter, we will only touch on it lightly. Once again we will clearly state: Dolores did not type, she did not text, she did not use a computer. This letter is dated December 30, 2009. This was three days after the events of Christmas 2009. Once again we see the emphasis on Power of Attorney, the aggression, the bad grammar, the use of certain words. Note that the date of Geoffrey's visit is wrong. He also includes his letter to the Bray Gardai. A week later he writes the “Taxi Letter” in a bid to bolster his “documented account”. Serious questions have been raised about the signature on the above letter; we know that during this time Ethan was signing his mom's name on numerous things for various reasons. The logo used on Dolores-Maxwell.com is the “D” from one of Dolores' genuine signatures. Whether the signature on the letter is forged or forced, Ethan's hand and voice are evident. We note the section of the letter that starts “In the event of me ever becoming incapable”. Leaving the grammar, this seemed to be a strange comment, coming out of nowhere. It certainly alarmed Saoirse later when it was learned that Ethan had previously sought to have an elderly relative declared a Ward of the Court, with Ethan having control over all of this relative's finances and affairs. Geoffrey Blair was also puzzled by this statement. Ethan returns to this theme over and over. We also note there were no copies of any correspondence purportedly from Dolores found in her home. There was a distinct lack of any record of her life in her house. There were no personal letters, few cards, no tax documents, minimal utility bills. There were no letters from her solicitor. No letters from the HSE which we know had been sent to her. No record of the Home Care Visits that are to be kept on premises. No record of doctor's appointments, even the one less than 48 hours before she was rushed to the hospital. No keys to the back door or side gates. Evidence of her life had been removed and sanitised by Ethan.